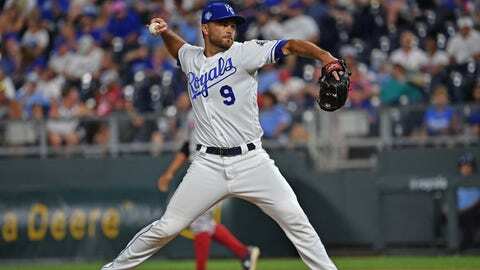 Royals backup catcher Drew Butera was pressed into duty as a relief pitcher late in the Royals' loss to the Red Sox and allowed two runs over 1/3 of an inning. KANSAS CITY, Mo. — Andrew Benintendi and the Red Sox easily made up for David Price’s bad outing. They needed the big finish to overcome Price’s poor start. He was lifted after 4 2/3 innings, allowing four runs on six hits with nine strikeouts. “You get two outs and think on the attack, but unfortunately it snowballed really quick on me,” Keller said. “I was trying not to get anybody hurt, including myself,” Butera said.